This page contains a couple of tutorials for you to follow. 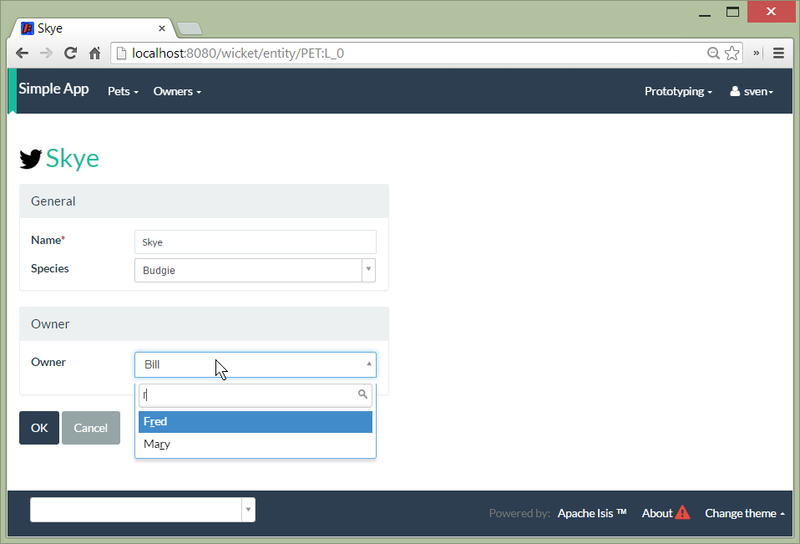 the "petclinic" tutorial takes you step-by-step through building a simple application of just three classes. There are example solutions in the github repo in case you get lost. an extended version of the "petclinic" tutorial, (with the text hosted on github repo). the "stop scaffolding, start coding" tutorial is taken from a conference workshop. It has less hand-holding, but lists out the steps for you to follow. It’s a good cookbook to follow when you’re readng to take things further. 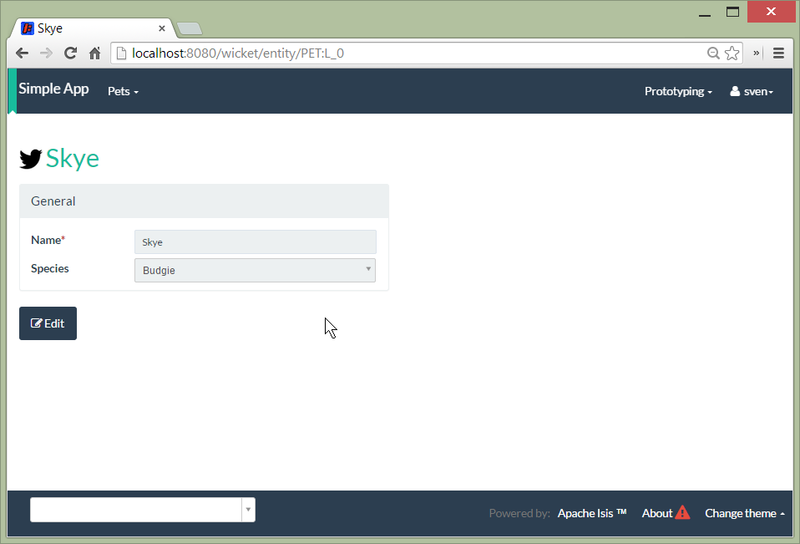 This is a step-by-step tutorial to build up a simple "petclinic" application, starting from the SimpleApp archetype. It was originally written by Jeroen van der Wal. Either follow along or check out the tags from the corresponding github repo. 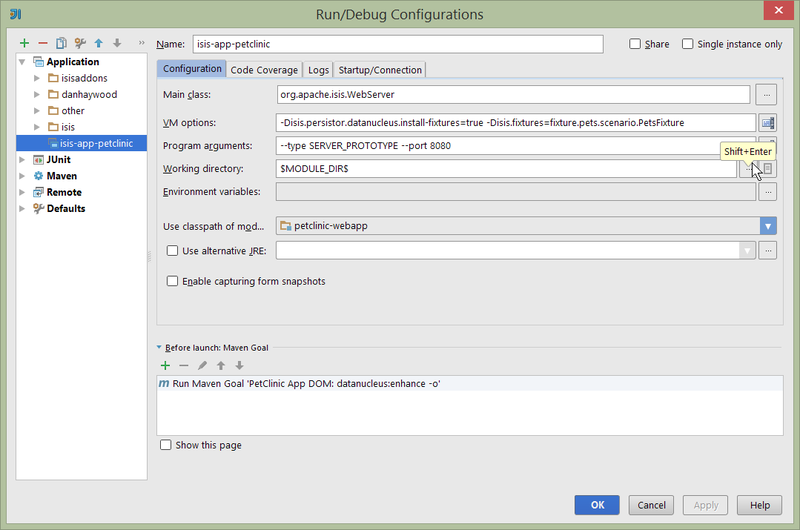 an IDE, such as Eclipse or IntelliJ IDEA. 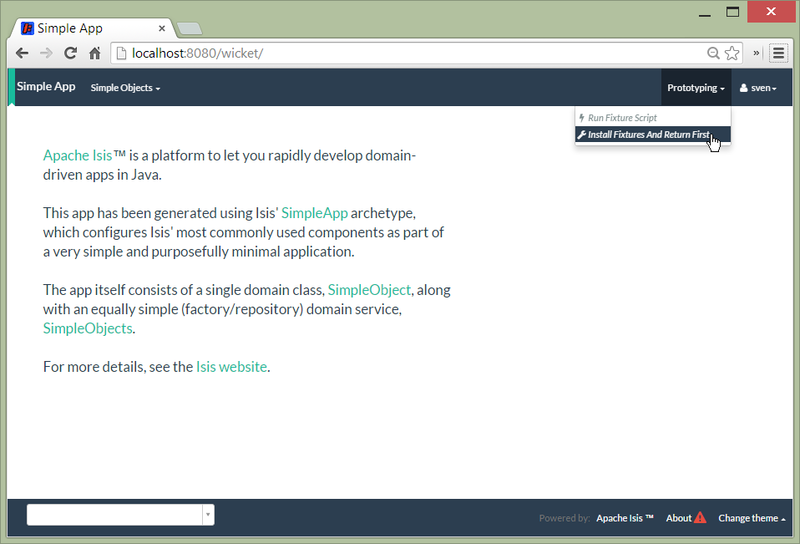 This tutorial was developed against Apache Isis 1.8.0-SNAPSHOT. Since then 1.8.0 has been released, so simply replace "1.8.0-SNAPSHOT" for "1.8.0" wherever it appears in the pom.xml files. 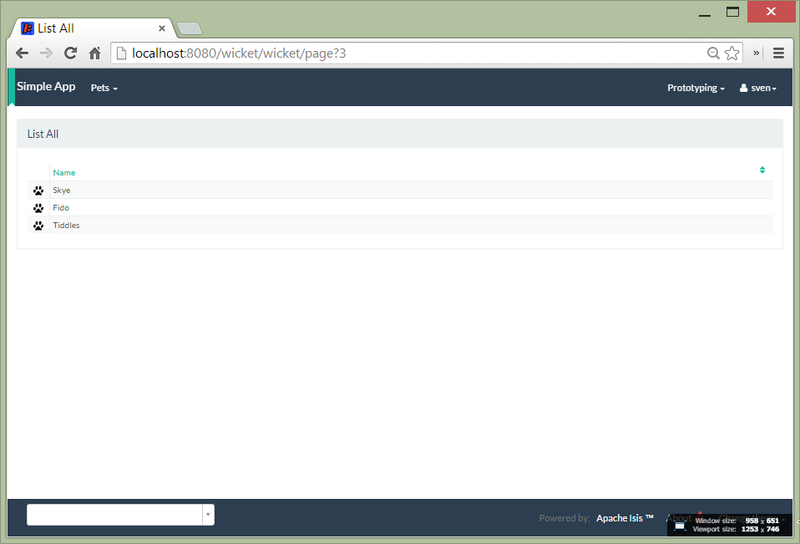 Navigate to the Wicket UI (eg http://localhost:8080/wicket), and login (sven/pass). Go back to the splash screen, and quit the app. Note that the database runs in-memory (using HSQLDB) so any data created will be lost between runs. 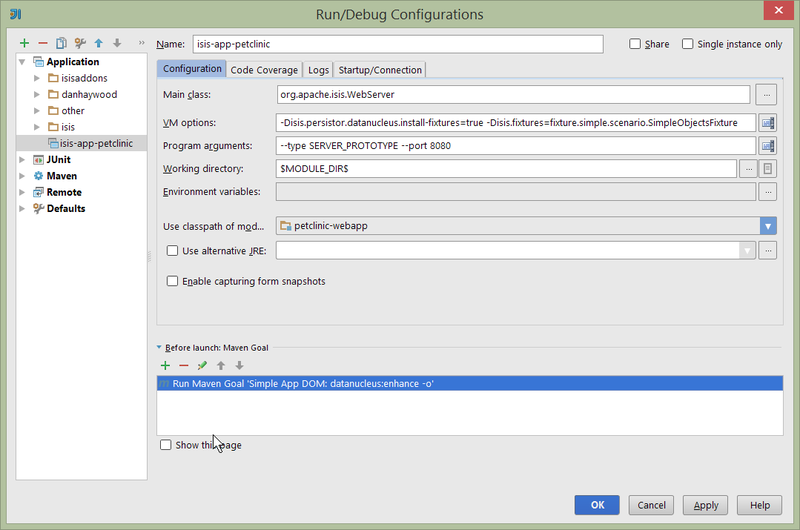 Set up an IDE and import the project to be able to run and debug the app. Testing is of course massively important, and Apache Isis makes both unit testing and (end-to-end) integration testing easy. Building the app from the Maven command line ("mvn clean install") will run all tests, but you should also run the tests from within the IDE. If you have issues with the integration tests, make sure that the domain classes have been enhanced by the DataNucleus enhancer. (The exact mechanics depends on the IDE being used). The POM files generated by the simpleapp archetype describe the app as "SimpleApp". Update them to say "PetClinic" instead. During this tutorial we’re going to keep the integration tests in-sync with the code, but we’re going to stop short of writing BDD/Cucumber specs. Time to start refactoring the app. The heart of the PetClinic app is the Pet concept, so go through the code and refactor. While we’re at it, refactor the app itself from "SimpleApp" to "PetClinicApp". delete the SimpleObject.png, and add a new Pet.png (icon shown against all Pet instances). in PetClinicAppFixturesService, change the package name from "fixture.simple" to "fixture.pets". in PetClinicAppSystemInitializer, change the package name "dom.simple" to "dom.pets", and similarly "fixture.simple" to "fixture.pets"
in WEB-INF/isis.properties, similarly change the package name "dom.simple" to "dom.pets", and similarly "fixture.simple" to "fixture.pets"
Update fixtures, unit tests and integration tests. Rather than using a single icon for a domain class, instead a different icon can be supplied for each instance. We can therefore have different icon files for each pet, reflecting that pet’s species. Also updated fixture data to set up a number of Owner`s, and associate each `Pet with an Owner. Also add unit tests and integration tests for Owner/Owners and updated for Pet/Pets. An extended version of the pet clinic can be found on this github repo. It was written by Johan Doornenbal. This version also includes a sample solution, also as a github repo. 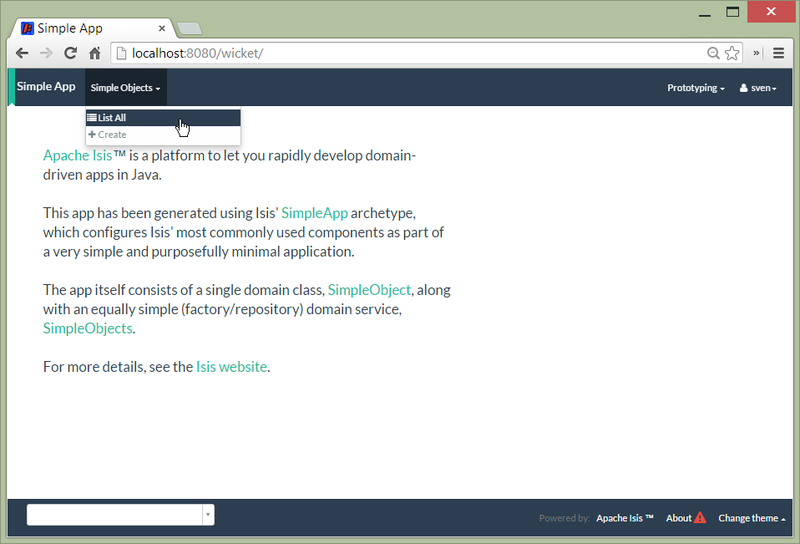 This is a half-day tutorial on developing domain-driven apps using Apache Isis. Actually, you could probably spend a full day working through this tutorial if you wanted to, so pick and choose the bits that look interesting. It was originally written by Dan Haywood. There’s a bit of overlap with the Pet Clinic tutorial initially, but it then sets off on its own. Although testing is important, in this tutorial we want to concentrate on how to write features and to iterate quickly. So for now, exclude the integtests module. Later on in the tutorial we’ll add the tests back in so you can learn how to write automated tests for the features of your app. Hopefully one of those ideas appeals or sparks an idea for something of your own. make the entity bookmarkable by adding the @DomainObjectLayout#bookmarking() attribute. Domain services often act as factories or repositories to entities; more generally can be used to "bridge across" to other domains/bounded contexts. Most are application-scoped, but they can also be request-scoped if required. use the injected IsisJdoSupport domain service. Most business functionality is implemented using actions� basically a public method accepting domain classes and primitives as its parameter types. The action can return a domain entity, or a collection of entities, or a primitive/String/value, or void. If a domain entity is returned then that object is rendered immediately; if a collection is returned then the Wicket viewer renders a table. Such collections are sometimes called "standalone" collections. 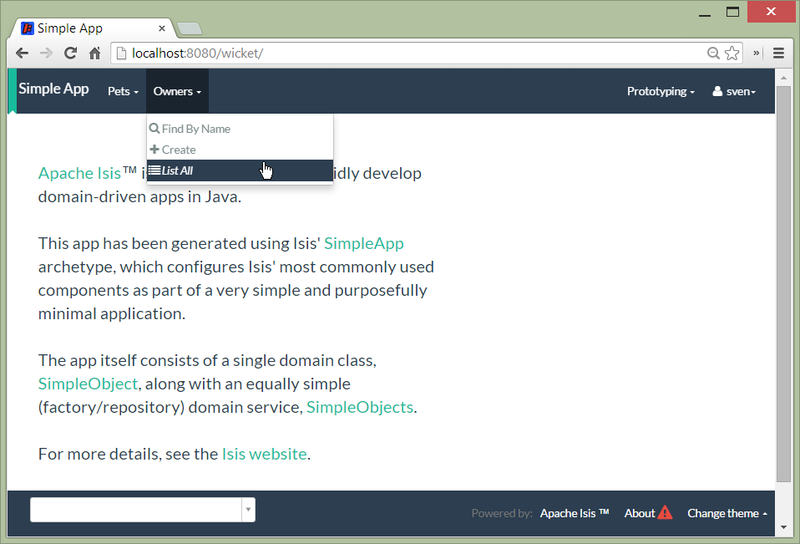 As well as exposing the Wicket viewer, Isis also exposes a REST API (an implementation of the Restful Objects spec). All of the functionality of the domain object model is available through this REST API. The semantics of an action (whether it is safe/query only, whether it is idempotent, whether it is neither) can be specified for each action; if not specified then Isis assumes non-idempotent. In the Wicket viewer this matters in that only query-only actions can be bookmarked or used as contributed properties/collections. In the RESTful viewer this matters in that it determines the HTTP verb (GET, PUT or POST) that is used to invoke the action. note whether the non-safe actions are bookmarkable (assuming that it has been annotated with @ActionLayout(bookmarking=…​), that is). Domain entities can also reference other domain entities. These references may be either scalar (single-valued) or vector (multi-valued). In this section we focus on scalar reference properties. Quick detour: often we want to set up defaults to go with choices. Sensible defaults for action parameters can really improve the usability of the app. The Wicket UI doesn’t allow collections to be modified (added to/removed from). However, we can easily write actions to accomplish the same. Moreover, these actions can provide some additional business logic. For example: it probably shouldn’t be possible to add an object twice into a collection, so it should not be presented in the list of choices/autoComplete; conversely, only those objects in the collection should be offered as choices to be removed. It’s also possible to use Font Awesome icons for the domain object icon. Delete the various hint annotations and instead specify layout hints using a .layout.json file. validity: allowing the user to modify the property/invoke the action, but validating that the new value/action arguments are correct before hand. Or, more pithily: "see it, use it, do it"
the @Programmatic annotation can also be used and in many cases is to be preferred; the difference is that the latter means the member is not part of the Apache Isis metamodel. 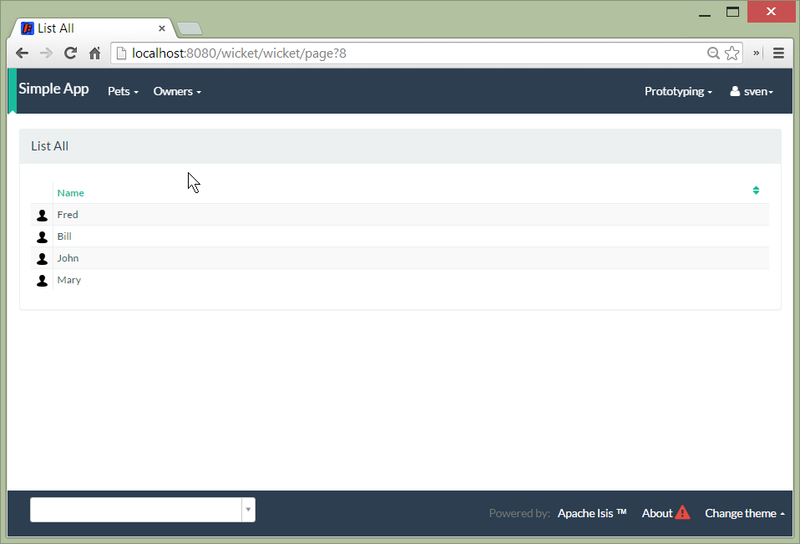 The Wicket UI will automatically invoke the "home page" action, if available. This is a no-arg action of one of the domain services, that can return either an object (eg representing the current user) or a standalone action. To ensure testability, there should be no dependencies on system time, for example usage of LocalDate.now(). Instead the domain objects should delegate to the provided ClockService. call ClockService.now() etc where required. 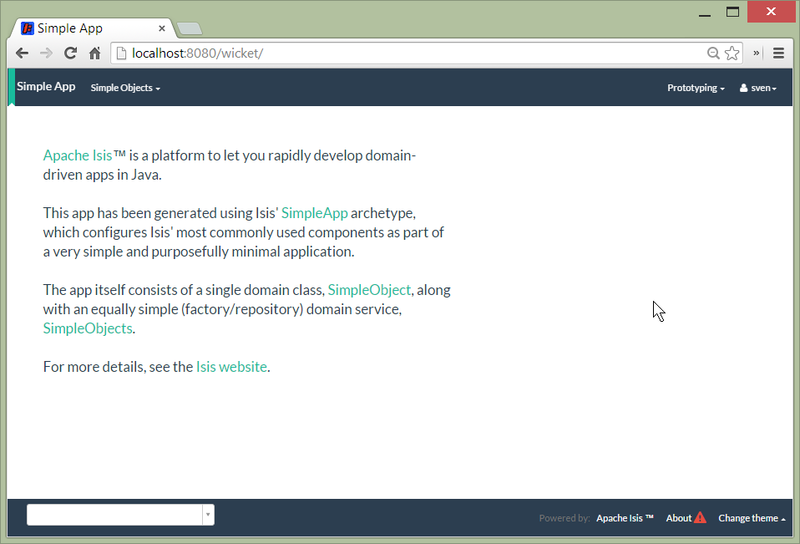 One of Apache Isis' most powerful features is the ability for the UI to combine functionality from domain services into the representation of an entity. The effect is similar to traits or mix-ins in other languages, however the "mixing in" is done at runtime, within the Apache Isis metamodel. In Apache Isis' terminology, we say that the domain service action is contributed to the entity. 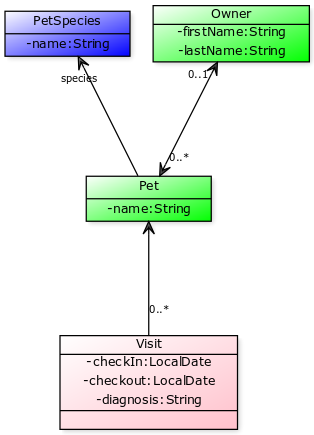 Any action of a domain service that has a domain entity type as one of its parameter types will (by default) be contributed. If the service action takes more than one argument, or does not have safe semantics, then it will be contributed as an entity action. If the service action has precisely one parameter type (that of the entity) and has safe semantics then it will be contributed either as a collection or as a property (dependent on whether it returns a collection of a scalar). Why are contributions so useful? Because the service action will match not on the entity type, but also on any of the entity’s supertypes (all the way up to java.lang.Object). That means that you can apply the dependency inversion principle to ensure that the modules of your application have acyclic dependencies; but in the UI it can still appear as if there are bidirectional dependencies between those modules. The lack of bidirectional dependencies can help save your app degrading into a big ball of mud. Finally, note that the layout of contributed actions/collections/properties can be specified using the .layout.json file (and it is highly recommended that you do so). Another way in which Apache Isis helps you keep your application nicely modularized is through its event bus. Each action invocation, or property modification, can be used to generate a succession of events that allows subscribers to veto the interaction (the see it/use it/do it rules) or, if the action is allowed, to perform work prior to the execution of the action or after the execution of the action. Under the covers Apache Isis uses the Guava event bus and subscribers (always domain services) subscribe by writing methods annotated with @com.google.common.eventbus.Subscribe annotation. By default the events generated are ActionDomainEvent.Default (for actions) and PropertyDomainEvent.Default (for properties). Subclasses of these can be specified using the @Action(domainEvent=…​) or Property(domainEvent=…​) for properties. Bulk actions are actions that can be invoked on a collection of actions, that is on collections returned by invoking an action. Actions are specified as being bulk actions using the @action(invokeOn=OBJECT_AND_COLLECTION) annotation. Note that currently (1.8.0) only no-arg actions can be specified as bulk actions. The QueryResultsCache (request-scoped) domain service allows arbitrary objects to be cached for the duration of a request. This can be helpful for "naive" code which would normally make the same query within a loop. Each element in the Wicket viewer (entity form, properties, collections, action button etc) is a component, each created by a internal API (ComponentFactory, described here). For collections there can be multiple views, and the Wicket viewer provides a view selector drop down (top right of each collection panel). Moreover, we can add additional views. In this section we’ll explore some of these, already provided through Isis addons (not ASF). The Excel download add-on allows the collection to be downloaded as an Excel spreadsheet (.xlsx). Use the instructions on the add-on module’s README to add in the excel download module (ie: update the POM). The Fullcalendar2 download add-on allows entities to be rendered in a full-page calendar. Use the instructions on the add-on module’s README to add in the fullcalendar2 module (ie: update the POM). 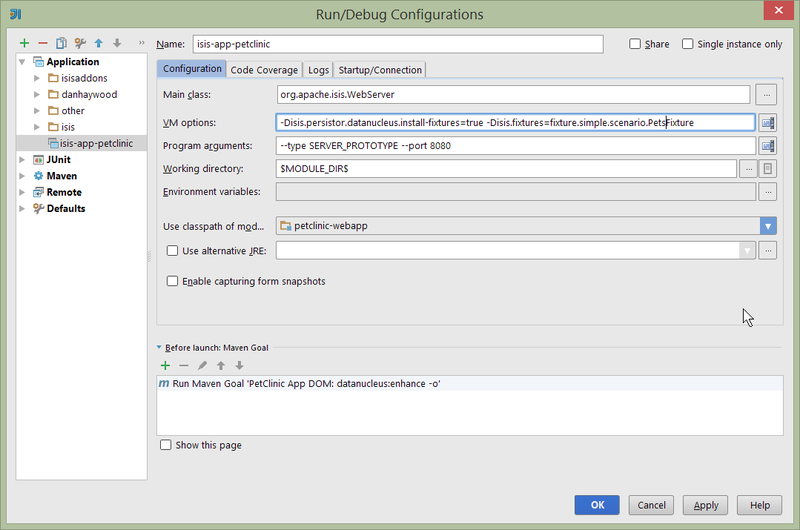 on one of your entities, implement either the CalendarEventable interface or the (more complex) Calendarable interface. The Gmap3 download add-on allows entities that implement certain APIs to be rendered in a full-page gmap3. Use the instructions on the add-on module’s README to add in the gmap3 module (ie: update the POM). In addition to providing Wicket viewer extensions, Isis addons also has a large number of modules. These address such cross-cutting concerns as security, command (profiling), auditing and publishing. In most cases users can accomplish the business operations they need by invoking actions directly on domain entities. For some high-volume or specialized uses cases, though, there may be a requirement to bring together data or functionality that spans several entities. 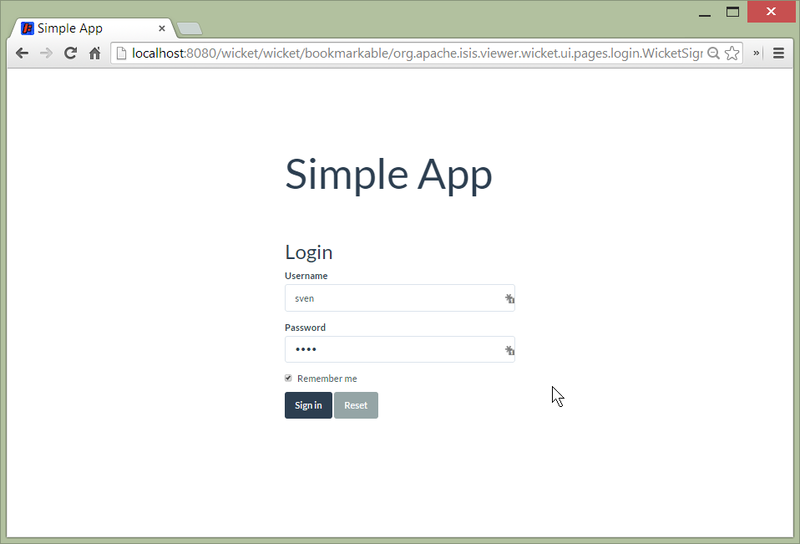 Also, if using Apache Isis' REST API then the REST client may be a native application (on a smartphone or tablet, say) that is deployed by a third party. In these cases exposing the entities directly would be inadvisable because a refactoring of the domain entity would change the REST API and probably break that REST client. To support these use cases, Apache Isis therefore allows you to write a view model, either by annotating the class with @ViewModel or (for more control) by implementing the ViewModel interface. Up to this point we’ve been introducing the features of Isis and building out our domain application, but with little regard to testing. Time to fix that. Unit testing domain entities and domain services is easy; just use JUnit and mocking libraries to mock out interactions with domain services. Mockito seems to be the current favourite among Java developers for mocking libraries, but if you use JMock then you’ll find we provide a JUnitRuleMockery2 class and a number of other utility classes, documented here. write some unit tests (adapt from the unit tests in the myapp-dom Maven module). Although unit tests are easy to write and fast to execute, integration tests are more valuable: they test interactions of the system from the outside-in, simulating the way in which the end-users use the application. There will probably be some compile issues to fix up once you’ve done this; comment out all code that doesn’t compile. Isis has great support for writing integration tests; well-written integration tests should leverage fixture scripts and use the @WrapperFactory domain service. use the tests from the original archetype and the documentation on the website to develop integration tests for your app’s functionality. The REST API generated by Apache Isis conforms to the Restful Objects specification. Apache Isis 1.8.0 provides experimental support to allow the representations to be customized. If you have an external database available, then update the pom.xml for the classpath and update the JDBC properties in WEB-INF\persistor.properties to point to your database. Copyright © 2010~2016 The Apache Software Foundation, licensed under the Apache License, v2.0.